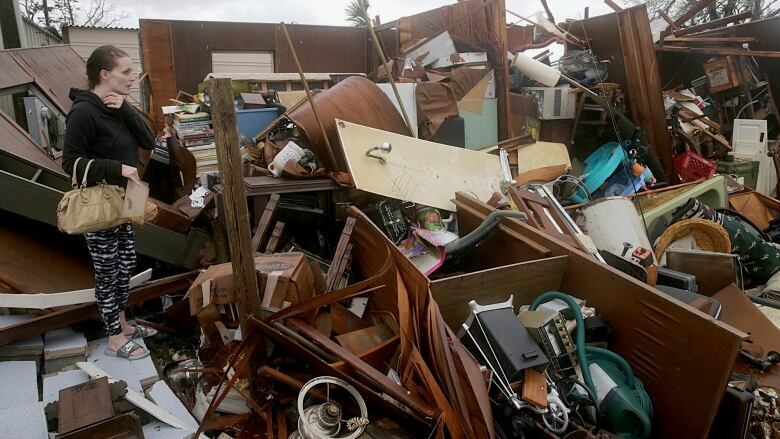 Hurricane Michael slammed into the Florida Panhandle with terrifying winds of 250 km/h Wednesday, splintering homes and submerging neighbourhoods before continuing its destructive march inland across the southeast. For Thursday coverage of Michael, click here. Hurricane Michael slammed into the Florida Panhandle with terrifying winds of 250 km/h Wednesday, splintering homes and submerging neighbourhoods before continuing its destructive march inland across the southeast. It was the most powerful hurricane to hit the continental U.S. in nearly 50 years and at least one death was reported during its passage. 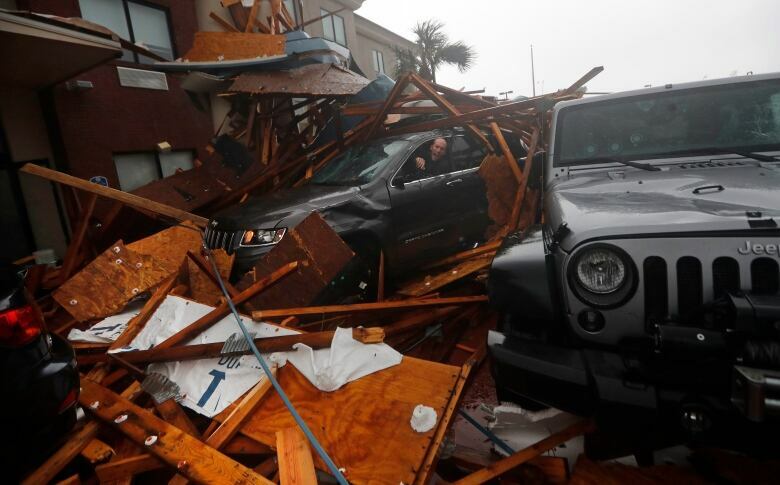 Supercharged by abnormally warm waters of the Gulf of Mexico, the Category 4 storm crashed ashore in the early afternoon near Mexico Beach, a tourist town midway along the Panhandle, a 320-kilometre stretch of white-sand beach resorts, fishing towns and military bases. After it ravaged the Panhandle, Michael entered south Georgia as a Category 3 hurricane with winds of 185 km/h — the most powerful in recorded history for that part of the neighbouring state. As Michael crossed Georgia, it weakened to a Category 1 with sustained winds of 145 km/h and a continued risk of heavy rain and flooding. 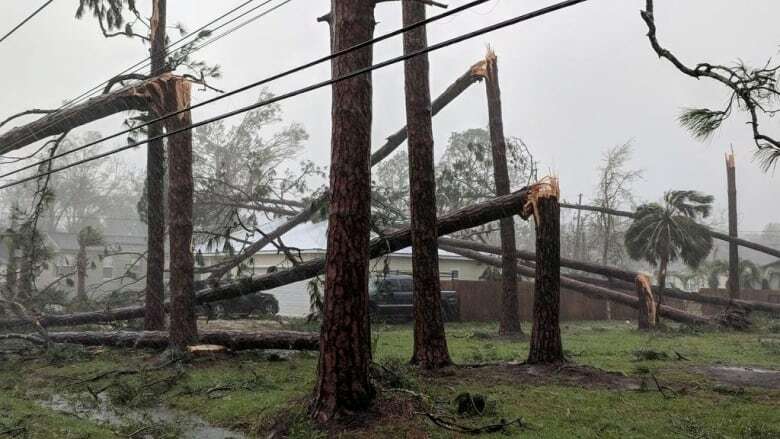 The National Weather Service has also issued multiple tornado warnings in Georgia, with local media reporting three tornadoes had touched down. 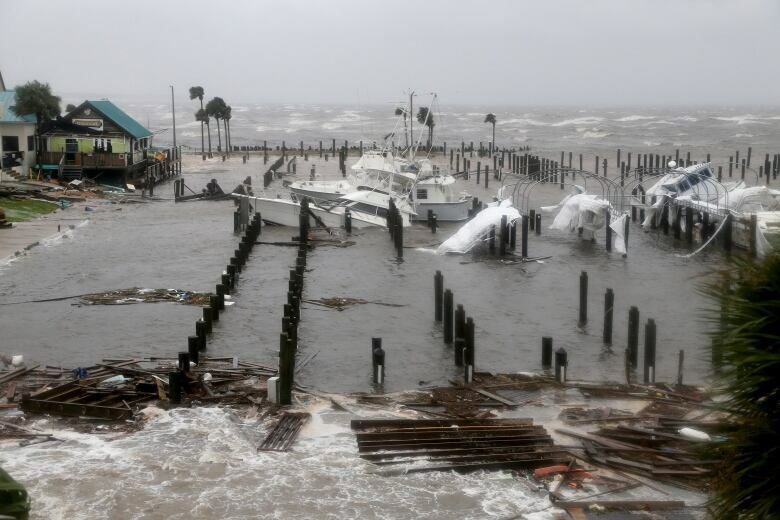 In north Florida, Michael battered the shoreline with sideways rain, powerful gusts and crashing waves, swamping streets and docks, flattening trees, stripped away leaves, shredding awnings and peeling away shingles. It also set off transformer explosions and knocked out power to more than 192,000 homes and businesses, the governor said. 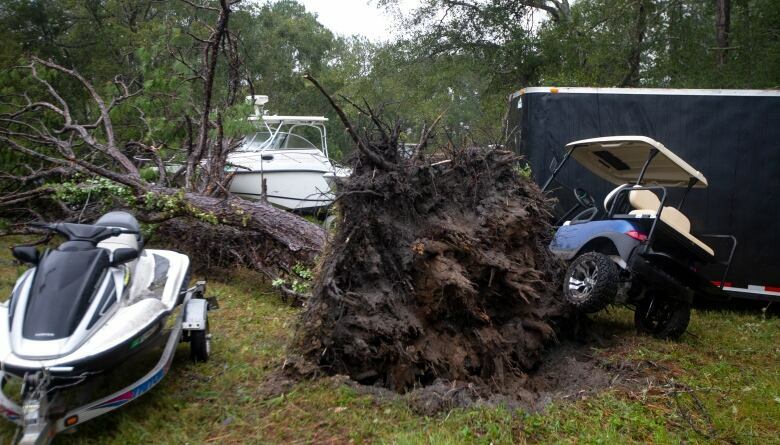 A man was killed in Greenboro, Fla., after a tree crashed through is home and trapped him, the local sheriff's spokesperson said. Vance Beu, 29, was staying with his mother at her apartment, Spring Gate Apartments, a small complex of single-storey wood-frame apartment buildings. A pine tree punched a hole in their roof and he said the roar of the storm sounded like a jet engine as the winds accelerated. Their ears even popped as the barometric pressure dropped. 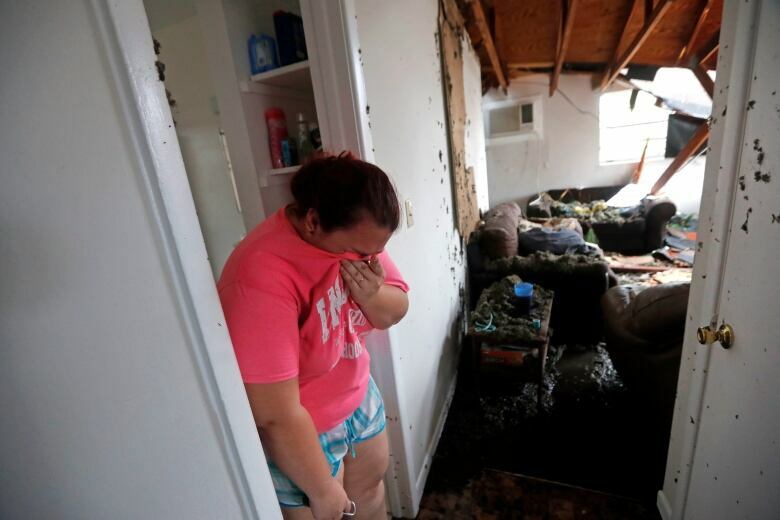 Kaylee O'Brien was crying as she sorted through the remains of the apartment she shared with three roommates at Whispering Pines apartments, where the smell of broken pine trees was thick in the air. Four pine trees had crashed through the roof of her apartment, nearly hitting two people. She was missing her one-year-old Siamese cat, Molly. "We haven't seen her since the tree hit the den. She's my baby." As Hurricane Michael continues it’s destructive path and leaves our state, we are now turning 100% of our focus on search, rescue, &amp; recovery. A water-level station in Apalachicola, close to where Michael came ashore, reported a surge of nearly 2.5 metres. A Red Cross official says some 320,000 people along Florida's Gold Coast chose to ride out the storm. Emergency managers say they don't know how many left the area, but there were about 6,000 people in 80 shelters in five states, including nearly 1,200 who are still in shelters following Hurricane Florence. Evacuation orders had been sent to 325,000 people. Based on its internal barometric pressure, Michael was the most powerful hurricane to blow ashore on the U.S. mainland since Camille in 1969. Based on wind speed, it was the fourth-strongest, behind Andrew in 1992, Camille, and the biggest one of all, an unnamed 1935 Labour Day storm that had winds 296 km/h. It appeared to be so powerful that it would remain a hurricane as it moved into south Georgia early Thursday. Forecasters said it would unleash damaging wind and rain all the way into the Carolinas, which are still recovering from Hurricane Florence's epic flooding. "We are in new territory," NHC meteorologist Dennis Feltgen wrote on Facebook. "The historical record, going back to 1851, finds no Category 4 hurricane ever hitting the Florida panhandle."